In this verse, Deen means the HEREAFTER, the RECOMPENSE and the FINAL REWARD. 2. Those who urges not the feeding of the poor. The hardness of the heart is a sign of disbelief of the Hereafter. This is because of the extreme stinginess and greed. Then Allah continues the verse by cursing the deniers of the YAUMUDDIN. Allah curses those who are heedless of their solah. Of which in their solah are SAHUN. These are the hypocrites. Who pray in public but not in private. They are those who pray and adhere to the prayer but yet are mindless of it. Or those who prayed outside the legislated time. Or those who delay their prayer until the very last minute. Or those who do not fulfill the pillars and conditions. Those who do not pray in humility and contemplating its meanings. Beware that that whoever has these characteristics then he has a share of this ayah. Be aware that Allah curses them. ‘Ala’ b. ‘Abd al-Rahman reported that they came to the house of Anas b. Malik in Basra after saying the noon prayer. His (Anas) house was situated by the side of the mosque. As revisited him he (Anas) said: Have you said the afternoon prayer? We said to him: It is just a few minutes before that we finished the noon prayer. He said: Offer the afternoon prayer. So we stood up and said our prayer. And when we completed it, he said: I have heard the Messenger of Allah (may peace be upon him) saying: This is how the hypocrite prays: he sits watching the sun, and when it is between the horns of devil, he rises and strikes the ground four times (in haste) mentioning Allah a little during it. This hadith describes how a hypocrite prays. He waits until the last minute of asr, and in haste stand to pray. Pecking the ground like a bird. And when he prays, he doesn’t even remember Allah (except very little) in it. He probably only stand so that people will see him pray and not seeking the face Allah. This is just as not praying at all. 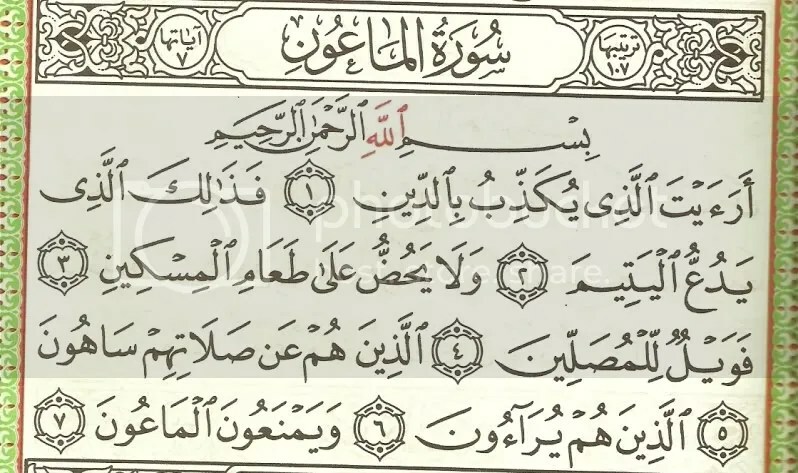 The sixth verse is a continuation of Allah’s curse. Allah curses those who do good deeds only to be seen. However if one does a good deed solely for Allah, but people come to know of that and is pleased with it, then this is not considered as showing off. 2. or to make him refrain from doing the good deed altogether. Most important thing is we must be SINCERE to do a deed for Allah. And the deed we are doing, are usually done even in private. For instance nawafil prayers. Oh Allah do not call me into account for what they say and forgive me for what they have no knowledge of and make me better than what they imagine. These are people who do not lend little things that benefit others even though they can do it. These people are even stingier when it comes to giving zakah and charity. 1. Allah curses those who are heedless in their solah. Who pray in public but not in private. 3. Great focus must be paid to one’s solah. 4. One of the signs of those who deny the Final day is that they are hard of heart with the weak and needy. 5. Islam places great emphasis on aiding the weak members of the society. 6. Allah curses those who only perform good deeds to be seen by others. This hadith is similar to the second hadith. But this one stresses on the fundamental of Islam. And it compares the fundamental aspects to the pillars or structures of building. If one fulfills these pillars, he has laid a solid foundation of building his deen. The other acts of Islam, which is not included as mentioned here is completes the fine touches of the deen. Failing these obligations, the entire structure of the deen is threatened. The most important pillar is the shahadah. Not believing in it destroys the rest of the deeds. The quran and hadith often use metaphors and similes to affirm a certain point. Or to make clear a certain meaning. comparing the sructure of a Mu’min’s deen which is solid compared to the weak structure of a munafiq. And the weak structure will bring to the collapse of his deen and thus hellfire. Using the metaphor of light as guidance in the heart of mu’min. A metaphor used to condemn those who fail to fulfill the amanah (i.e. religious obligations) can be found in Surah Al-Jumu’ah (62): ayat 5. The Bani Israel, having failed to obey Allah’s commandments in the Taurah, are described as a donkey which is burdened with heavy books on its back but doesn’t understand anything from them. Scholars have said that this metaphor also applies to other nations, which fail to fulfill their amanah. In one hadith the Prophet, sallallahu ‘alayhi wasallam, divided the status of his ummah into three categories: those who benefit from the Message, those who benefit partially and those who fail to benefit at all. He, sallallahu ‘alayhi wasallam, used the metaphor of rain (as the Message) falling down on different types of land, producing different results. The hadith says iqamis salah yaani performing salah or establishing solah rather than praying. Let us strive to establish solah properly. Thus making our pillar strong. Zakat must be taken out in certain percentages if we own a propert under certain condition. When we earn, we must learn how much we should give as zakat. Fasting in ramadhan is obligatory to all Muslims.It’s also an intensive training programme for al Muslims. The month that we are more motivated to perform so many deeds possible. We were talking about sleep the other day. The REM, dreams and how much sleep we all need. The need to sleep early and all. What better way is to tell the children about sleep if it is not an Islamic way. The sunnah way. Sleep is after all one of the major activity in our daily lives. 2. Have wudoo on you. One should sleep as soon as one finishes their Isyak prayer. So try to keep your wudhu’ until you sleep. With wudhu’ Shaytan will be less able to disturb us in our sleep, Insya Allah. 3a. We must make sure all the doors are locked. And if we are using lamps, candles and fire, we must extinguish them before sleeping. Mention Allah’s name for Shaytan cannot open closed doors. We want to try our best so that Shaytan does not mix with us. 3c. From the hadith above, it is clear that we must also cover our containers and utensils even by placing something across it. Cover vessels, waterskins, close the doors and extinguish the lamps, for the Satan does not loosen the waterskin, does not open the door and does not uncover the vessels. And if one amongst you fails to find (something) to cover it well, he should cover it by placing (a piece of) wood across it. Qutaiba did not mention the closing of the doors in the hadith transmitted by him. 4. It is recommended to use the inside of the lower garment. 2. To place our right cheek on our right hand. Continuation from our last seerah session. We last talked about events at Jabal thawr and had special mentioning of our heroin Asmaa bint Abu Bakr r.a.
Today we continued the story of the journey up to the arrival at the outskirts of Madina i.e. Quba’ and the construction of the first masjid of Islam, Masjid Quba’. 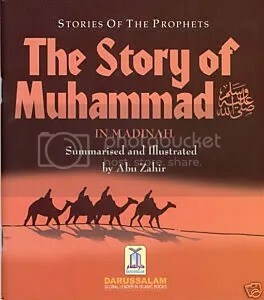 We read the children’s book, The Story of Muhammad s.a.w. in Madinah by Abu Zahir. And I added extra punches from the book, “The Sealed Nectar (Ar Raheeq Al Makhtum”. Rasulullah s.a.w. himself help construct it with the companions. Ash Shamus bint An Nu’man said that she looked at Allah’s Messenger s.a.w. when he arrived and built the mosque and she saw him carry stones until he became bent over by the stones and she could see the whiteness of the dust on his stomach. A man from the Companions came and said, “May my father and mother be sacrificed for you, O Messenger of Allah, give it to me and I will be sufficient.” But he replied, “No, take one like it.” He carried on working until it was built. Al mustadrak by Al Hakim and was authenticated and confirmed by the researchers Allush. Masjid Quba was made reference in the Quran (Tawbah 9:108). Allah encourages His Prophet s.a.w. 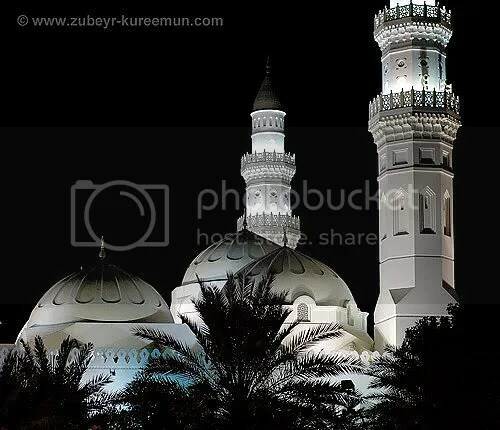 to pray in Masjid Quba’s, which, from the first day, was built on taqwa, obedience of Allah and His Messenger s.a.w., for gathering the word of the believers and as an outpost and a fort for Islam and its people. This verse is also sent down to not allow the Prophet s.a.w. to pray in a masjid near Quba which was built by the hypocrites of Madinah as a fort against Islam. (Never stand you therein), prohibiting His Prophet and his Ummah from ever standing in it in prayer. 1. May we be among those with ilmu and practise it. 2. Allah does not allow us to worship at a place where the purpose of built is to disunite the disbelievers. 6. Masjid Quba’s is also referred as Masjid Taqwa in the Quran. Of which it is built on piety.